The premise of Wendy Walker’s The Night Before is certainly a fresh one, diving into the modern world of online dating and its potential scares. I really enjoyed that this book focused on something so common in this day and age, but with more twists and turns as well as deeper issues. The plot starts simple, a blind date and a nervous girl with a damaged, and actually infamous past. The book focuses on more than the blind date, going into the territory of mental health, self awareness, and challenging upbringings. That’s all I really want to say about the plot itself, for fear of giving too much away, but just know its more than just a book about dating. As I said, I don’t want to give too much away about the plot itself, but I do want to share my thoughts about the other aspects of the book. I’ve actually been pretty torn on how to rate this one, because there were some parts I loved and some parts that I felt had potential but didn’t get all the way there. On one hand, I think the pacing was excellent and constantly kept me on my toes. This is going to be a huge hit this summer for the unique plot line and immersive writing alone. I actually had to force myself to turn off my Kindle and go to sleep- it’s that thrilling. I was constantly wondering what was going to happen, and who the real villains were. Unfortunately I do think I figured out the plot twist a little too early for my liking, and would like to have been more surprised by the end, but that’s just personal preference. Some readers really love to use their armchair detective skills, so they would probably really enjoy this slow reveal. I think I just felt like the plot was a bit spoon-fed for me and tried to hard to make everything neat and perfect. Another possibility is that I read too much of this genre and can’t be totally shocked by what I read anymore, which is also just a personal issue! Although I liked the pacing and the alternating perspectives, the other aspects of the writing fell a bit flat for me. I didn’t ever really connect with any of the characters, in fact, I didn’t really like any of them at all. I think they could use some more flushing out, maybe by making the book a bit longer and diving deeper into each of their histories? I don’t necessarily need likable characters, but I think I would have liked to see a bit more character development here. Although I do understand the book takes place in basically one day. Again, I really did love getting multiple perspectives on the same night and getting constant cliffhangers at the end of each chapter! 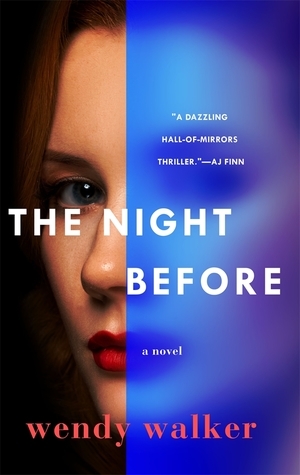 Overall, I think The Night Before is a fresh idea and I absolutely know it will be a hit this summer, I think it was just kind of middle of the road for me, and that’s ok. It was still a very fun read that I finished in a few sittings and would still most likely recommend to my other thriller friends! I will definitely be checking out Wendy Walker’s previous novels too. Thank you NetGalley, Wendy Walker, and St. Martin’s Press for the ARC of this novel and the opportunity to enjoy early in return for my honest review. Has anyone else read this? What were your thoughts? Comment below!